Google added a new option to the web search toolbelt: page previews. If you click on "Show options" and select "Page previews" after performing a search, Google will show a longer snippet and a thumbnail for each search result. Google's thumbnails include a small part of the page, so they aren't always helpful. Another issue is that all the thumbnails from a search results pages are merged and the resulting image doesn't load instantly. 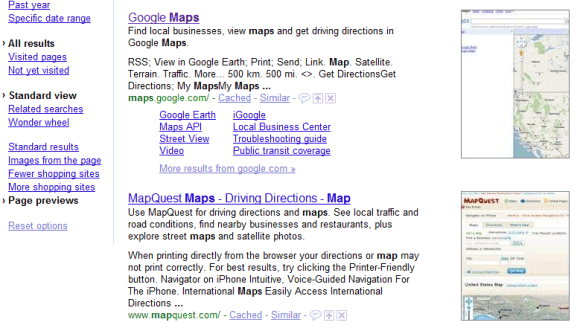 Example: search results for [maps]. Looks cool, but I don't see that option. When I try the example "Maps" link it just performs a regular search with the message "The search option you have selected is currently unavailable." at the top. With this addon for Firefox https://addons.mozilla.org/en-US/firefox/addon/189 look search results curiously. For me are google thumbnails big, but good experiment. Not bing, but Czech Seznam (seznam.cz) was the first. It's not important who was the first who came up with this idea. 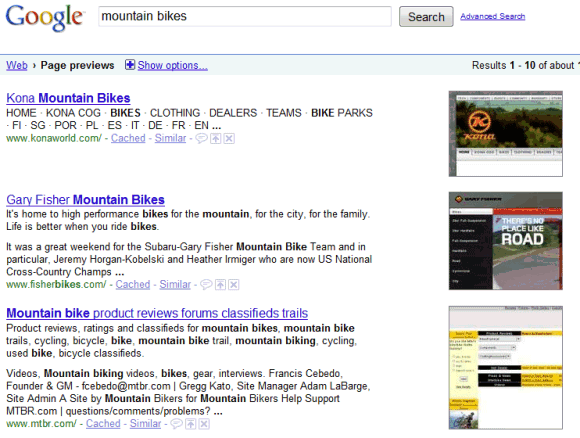 Let's see who is the first search engine that has a great implementation. The idea is far from novel: snap.com launched in 2006 and its most exciting feature was site previews, Google's experimental site SearchMash added previews in 2007 etc. I had thumbnails at Findforward.com back in 2004 too, but I second Ionut's comment. (The idea of thumbnails is obvious, and I would be surprised if Findforward was the first.) Even Google tried them a long time ago, if I remember correctly (IIRC there was a quote by Sergey Brin saying that), but apparently Google decided against it back then. Can anyone dig up that Brin quote? Not Bing, but Czech Seznam.cz was the first with screenshot.. I am not seeing this when I search. Joe, you need to do a search and then on the top left hand side click on 'show options'. It at the bottom of the list. Great tool, I already use Search Preview at home on Firefox but a great thing to use at work where we are restricted to IE. Google is becoming more and more bloated just like Microsoft, Apple, Linux, and OpenOffice. It's a good idea. Bing shows selected text instead of thumbnails images. The author said the thumbnails "aren't always helpful." If the developers can resize the images, then focus on the content verses the navigation, it would be better. I wonder how website's bandwidth is affected by these thumbnails. Are they realtime or cached? How often are they cached? The search option you have selected is currently unavailable. The page preview option is still not available here..
Is there a way to lock in the image preview option as a default setting? Unlike Bing, it looks like you have to manually enable it with each search. I didn't know that Bing offers image previews. Where can you find this feature? Can anyone explain why some results don't have a thumbnail generated yet? Is there any possibility to trigger the generation of thumbnails? this is awesome ... and for any whiners ... its NOT bloated if its an OPTION ... so you CHOOSE to select it ... like Firefox ... and unlike Apple.